You might call this story the “Central Oregon Dream,” and it starts as many stories here do. In 1992, a couple of friends came to Central Oregon to go snowboarding…and never left. 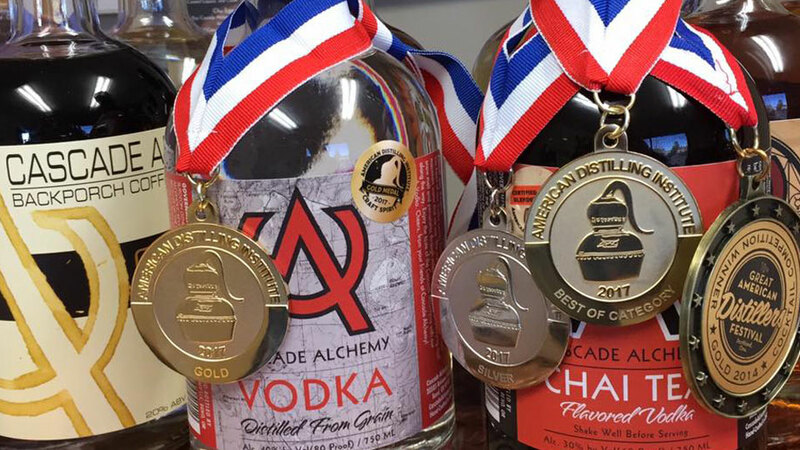 Starting on a shoestring budget, three partners built Cascade Alchemy into a premier distillery through devotion and hard work. Using simple, all-natural ingredients and local botanicals, they produce some of the most distinctive spirits on the West Coast, like their unique Oregon, crafted with juniper berries hand-picked in the Badlands just east of Bend. The delightful flavors draw from the floral tones of the berry, not the resins, with a light cucumber finish. Even “non-gin” people like this gin. They blend locally-made Chai Tea with their vodka for the Chai Tea Vodka that’s become one of their best sellers. They’ve got six signature spirits, including Apple Pie and Hot Pepper Vodka and you can give them a taste by stopping by their distillery. The best time to drop by is Mondays and Fridays from 8:00 a.m. to 4:00 p.m. when they’re there working hard and making killer products. They’re also in Saturdays from 10:00 a.m. to 4:00 p.m., but they welcome you to come by for a sample any time the door’s open.